The Best Vacation Rentals in Ocean City NJ, Sand Dollar Suites. 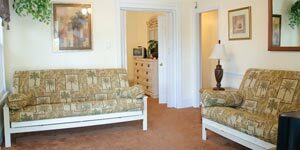 Welcome to the Sand Dollar Suites, The Sand Dollar Suites has 4 full suites ranging from 475 sq. ft to 1475 sq. 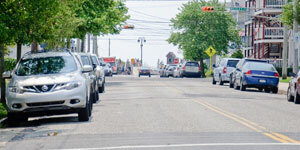 ft, we welcome you to explore our website and stay with us in Ocean City, New Jersey. 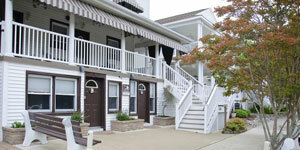 The Sand Dollar Suites is centrally located just 330 steps from the beach and boardwalk on 13th street in Ocean City. We would like to reserve for next year for July 28 -August 4, 2018. Mario, I just have one tiny request. If possible and you come across a larger table for Unit B, that would be great. There use to be a table that would seat all of us. If not, no big deal, this is just a request. Thank you for all you do. It truly feels like home away from home. Have a wonderful summer. You work so hard and always with a smile. I hope you get some R & R at some point during the year. We all had another fabulous week at the newly named “Sand Dollar”! It is beautiful with the new siding and all the cute Sand Dollar things tided into the name. None of us were ready to go home. It was an exceptional week! Everything we need, plus clean and neat. The outdoor shower is a real treat! Suzanne and Linda would like to reserve Unit A & B for July 29, 2017 – August 5th 2017. You work so hard, hope you get to vacation too. Very nice, clean place. Fairly priced. Owners are very compliant to your needs. Looking forward to returning next summer! The Sand Dollar Suites is “Home away from home”! Each room is equipped with all necessities, anything that you need is there. The outdoors is also fully equipped, including an outdoor grill, outdoor shower and bathroom, washer and dryer plus clothes lines. Everything is kept spotless. If something breaks, Mario is right there to repair or replace it. He could not be any nicer, great guy! Thank you so much for your warm hospitality this week. My family and I really appreciate a clean, comfortable apartment so close to the beach! I stay at the SandDollar every year for 4 weeks. I just love these beautiful suites! They are so very clean and put together nicely. The front and back decks are a nice place to sit and relax. It is located in the best area in town. The owner is the best. It’s a great family atmosphere. Great people, great price. I love it!